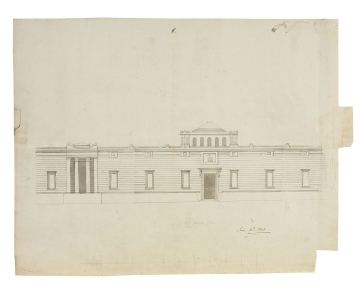 Drawings 1 and 2 show part of the screen wall on Princes Street. 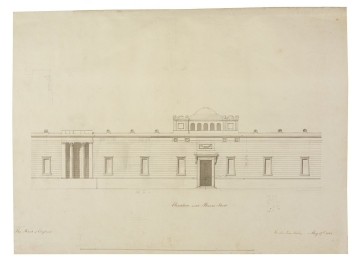 Both of the drawings show a domed roof over the Doric Vestibule (Princes Street vestibule) but the drawings show variant designs. The wall has banded rustication and is raised on a socle, with antefixes at the roofline. Paired columns 'in antis' are at one end and surmounted by a blocking course. In drawing 2, lion sculptures have been added in pencil and the blocking course has been altered. Over the door is a sculpted panel showing Britannia. 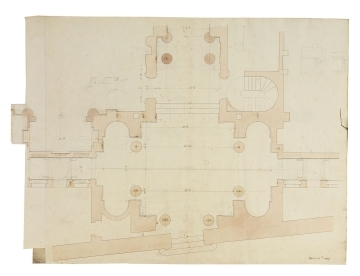 See verso of Drawing 49 in the Doric Vestiuble scheme for a similar drawing, possibly a copy of drawing 2.